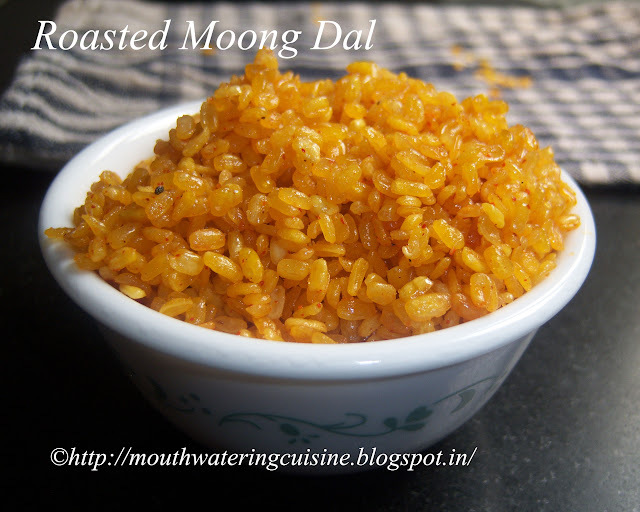 Roasted Moong Dal or fried moong dal is the favourite dish of most kids. Even we elders also like it very much, we like to have it with a hot cup of tea or just take a fistful of them and enjoy it while reading an interesting novel. Relish it while watching our favourite movie and feel like sitting in a theater. Wish to buy whenever go out for a movie, but could not enjoy it to the brim. They are not sufficient. So thought of making them at home, tried twice. First time fried them directly in the hot oil without soaking, they turned out soggy and oily too. Second time soaked and fried them in hot oil on high flame, either they burned or did not fried completely. At last i could achieve the goal today by making them properly as in Haldiram's Moong Dal pack. Liked them by every one of the family. Heat water in a thick bottomed vessel. Add this water to moong dal to soak it. Soak it for half an hour then drain the water and dry it for another half an hour. This will make it dry partially. Heat oil in a kadai, I used a slotted vessel with handle. We can use steel juice strainer also. Keep the slotted vessel in hot oil, slowly add some portion of moong dal. Fry them in the hot oil till we get the the crisp sound from the dal. When we shake the dal, we should get a crackling sound from it. Take them onto a kitchen towel to drain excess oil. Do the same with remain dal. Once all done, add salt, red chilli powder, black salt and garam masala. 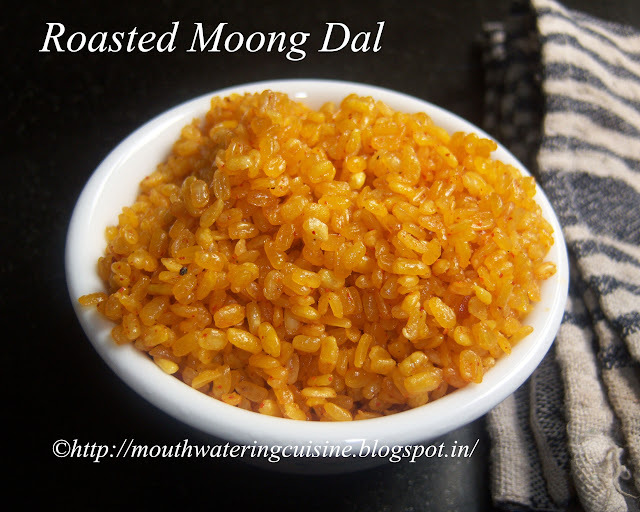 Serve crispy roasted moong dal with hot cup of tea or any time.